The rising tide of populism and America-first sentiments are finally gaining ground in U.S. politics, and as a result “America-last” senators and congressmen are being forced out of office. Recently, at least two have announced they will not run for re-election, citing the poor chances of winning against candidates whose policies more closely mirror the desires of America’s voters. A number of Republican senators and congressmen who have publicly criticized President Donald Trump’s agenda recently announced they will not be seeking re-election during the next election cycle, signaling yet another triumph of Trump’s America-first populism, which has divided the GOP between Trump-supporting Republicans and establishment-serving, internationalist Republicans increasingly out of touch with conservative and right-wing voters. Jeff Flake, Arizona’s junior Republican senator who frequently criticizes Trump, is facing a tough primary challenge from Kelli Ward, a populist, America-first former state senator who has the backing of Trump and former campaign advisor Steven Bannon. Flake recently announced he would not seek re-election due to the fact his failed “conservatism” is no longer popular or viable among traditional GOP voters. “It is clear at this moment that a traditional conservative who believes in limited government and free markets, who is devoted to free trade, who is pro-immigration has a narrower and narrower path to nomination in the Republican Party,” Flake stated during a speech on the Senate floor announcing his decision to not seek re-election. Flake’s faux conservatism, which is quickly being discredited by Trump’s America-first populism and nationalist rhetoric, is simply out of touch with rank-and-file GOP voters, who have been craving the sort of bold, uncompromising leadership Trump and his movement offer and represent. “If I could run the kind of race I’d like to run and believe[d] I could win a Republican primary, I might go forward,” Flake later told reporters, underscoring the reality of just how disconnected Flake and other establishment GOP political leaders are. Trump has harshly attacked his GOP critics since becoming president, including Flake. In August, Trump expressed joy that Ms. Ward would be running against Flake, accurately describing the Arizona senator as weak on borders and crime. Tennessee Republican Sen. Bob Corker, yet another GOP political leader who has publicly sparred with Trump, also recently announced he would not be seeking reelection in 2018. “After much thought, consideration and family discussion over the past year, [wife] Elizabeth and I have decided that I will leave the United States Senate when my term expires at the end of 2018,” Corker declared in a statement announcing his decision. Corker has repeatedly criticized Trump, perhaps most notably in the aftermath of the Unite the Right rally in Charlottesville, Va., a legally organized and sanctioned rally that was sabotaged by local and state law enforcement and political leaders with left-wing political affiliations. These political developments potentially represent a stark departure from the failed faux conservatism championed by establishment Republicans, who for far too long have been driven by a globalist, neoconservative, America-last political perspective that is being exposed for the fraud it is by Trump and other America-first populists. John McCain, the senior senator from Arizona who is a close ally of Flake, demonstrated just how contrary his increasingly unpopular and out-of-touch brand of conservatism is during a recent speech attacking Trump and his positions. “We have to fight isolationism, protectionism, and nativism,” McCain stated. “We have to defeat those who would worsen our divisions.” He later went on to attack the notion that America could put her political and economic interests first, which more and more Americans are becoming increasingly tired of hearing. 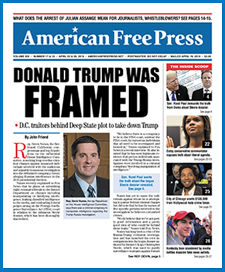 This newspaper, and millions of Americans across the nation, welcome the rise of an America-first, populist political movement, which has been championed so well by Trump thus far. Yeah, I think if Trump were a real America First president, this would be news. These disappointed characters are merely acting on the stage. Trump has shown himself to be an Israel-firster and war-firster from the git-go. And he is a politician and a master of the deal – the deal still being about the money and power of the elite, not about protecting and promoting liberty. Trump is only going to manipulate, play and co-opt the populist movement out of any significance. If you can’t shut them up or out, swallow them. Call me cynical, but that is how I see it. Sounds good, some things that are still lacking in Washington is the total decimation of the political appointees, and other hangers on, from the era of the Bushes, Clinton and Obama, they all need to be canned and forbidden to ever again attempt to influence the government of, by and for the people in any way what-so-ever! For as long as these moles are left in place to surreptitiously undermine the government, this nation will be in turmoil! Another thing that needs doing is the revocation of the citizenship of George Soros and banning him from ever again entering the United States, Puerto Rico etc. He must be forbidden to conduct any business at all in the United States no matter what he may title the organization he is using as the vehicle for disrupting the peaceful activities of citizens throughout the U.S, and its territories! If the small country of Hungry can do this than so also can the United States!